Save 10% on Transforming Technologies Resistance Ranger Dual-Wire Constant Monitors. Just use our FPF012916 Coupon Code (auto applied) to get the discount. This Featured Product Friday (FPF) promo is valid from today, January 29, 2016 through Sunday, January 31, 2016. 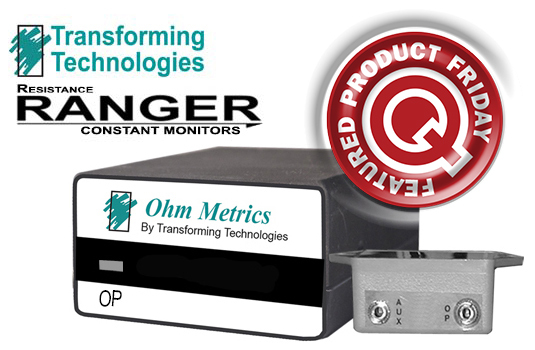 Transforming Technologies’ Resistance Ranger Monitors offer cost-effective, accurate continuous monitoring of workstation grounding products via their superior dual-wire technology. The systems sound an alarm if there is a grounding failure. Use the Featured Product Friday discount code as many times as you like while it is valid—and you’re encouraged to share the code with your friends and colleagues. Please let us know what products you’d like to see featured in our promotions. Follow our weekly FPF selection on The Q Source Resource Blog, via our email newsletter, or on our social media accounts. Visit QSource.com every Friday for the latest FPF offers (look out for our FPF logo) and please help us spread the word about Featured Product Friday. For further questions about Featured Product Friday, please read our informational blog post (http://blog.qsource.com/2013/12/q-source-debuts-new-featured-product.html), call us (800-966-6020), or send us an email. Please note: This promo is valid only at QSource.com and expires on January 31, 2016.